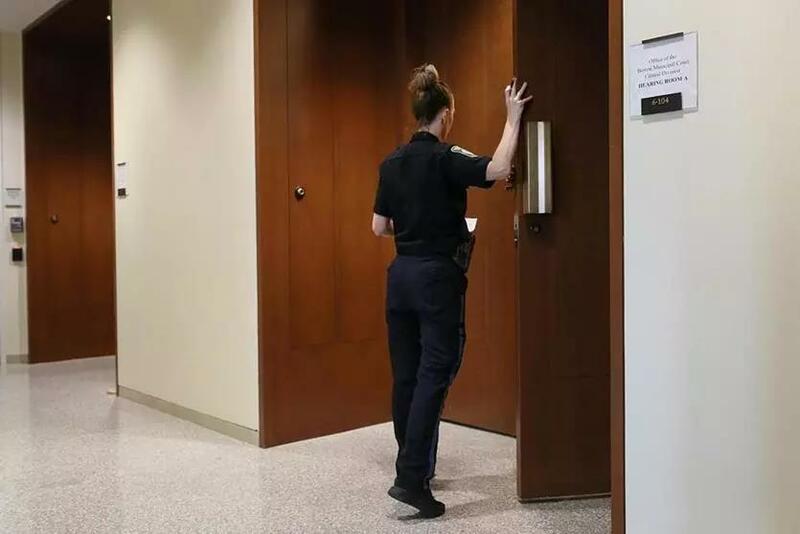 An officer guarded the door during a show cause hearing in Boston. It is in darkness that justice goes to die. And where there is no transparency, there is indeed darkness. For far too long that has been the case for show-cause hearings in district courts throughout the Commonwealth. 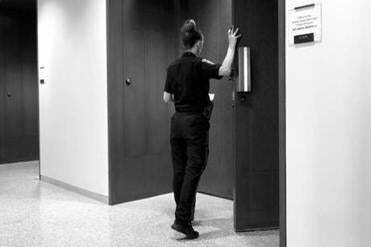 But it doesn’t have to be that way, and finally the court system has provided a glimmer of hope that it understands the importance of dealing with an issue that threatens the very credibility of the judicial system. A Trial Court Working Group, cochaired by retired Worcester District Court Judge Paul LoConto and current Boston Municipal Court Judge Kenneth Fiandaca, has recently been set up to “look at processes related to show-cause hearings and complaint standards,” a spokesperson for the courts told the Globe editorial page. LoConto was a former clerk magistrate himself and went on to chair the Commission on Judicial Conduct. The court move follows two Globe Spotlight Team reports, the most recent focused on Quincy District Court, where the 88-year-old clerk magistrate who has reigned there — and we do mean reigned — since 1982, has refused to make public any records of court hearings involving a Plymouth county commissioner and a high-ranking Quincy city employee. Spotlight’s earlier probe, published in September, was the first to expose the secret district court proceedings routinely held out of public view and without any resulting public record. Just to be clear, no judge could get away with this in any proceeding involving adult offenders. The show-cause hearings are the exclusive purview of clerk magistrates — many of them nonlawyers — who, once appointed, serve for life. The hearings are designed to decide if there is enough evidence in the case to issue a criminal complaint. Quincy’s clerk-for-life is Arthur Tobin, a former Quincy mayor, city councilor, and state senator. And in the two most recent cases, Tobin said the hearings were held by assistant clerks who, he insisted, dismissed the cases at the request of the parties. But all we have is Tobin’s word on that, since he refuses to produce any records. One case, pieced together from Quincy police records, involved Plymouth County Commissioner Gregory Hanley, a former Quincy city councilor. The second case that disappeared into the ether over at Quincy District Court involved Frank Tramontozzi, who oversees Quincy’s downtown redevelopment, and an MBTA Transit Police officer. MBTA records tell us the clerk dismissed the case after Tramontozzi apologized. “The transparency that open proceedings afford may be especially important if a well-publicized show-cause hearing results in an decision not to bring criminal charges,” Justice Judith Cowin said, writing for the court. It’s a point clearly lost on Tobin. Yes, legislation to require a more transparent system is an option. However, the clerks have always exercised an inordinate amount of influence over the Legislature. And it’s the court system itself that created this problem, back in 1975, under a new set of rules that “presumptively” closed show-cause hearings. So, no, this was not exactly written on stone tablets. Couldn’t the courts just as easily adopt a rule under which such hearings are open unless there is a good reason to close them? The court’s own working group has the ability to correct this lack of transparency and, with it, the impact on public trust. There is no substitute for justice delivered in the bright light of day — even by clerk magistrates. That’s the policy that should be etched in stone.